Super Savings Item! Save 37% on the IZTOSS 100A Buss Bar Stud Terminal, 4 x #10-32 Terminals by IZTOSS at Atoz Car Rental. MPN: F2553. Hurry! Limited time offer. Offer valid only while supplies last. Tin Plated brass/ABS. 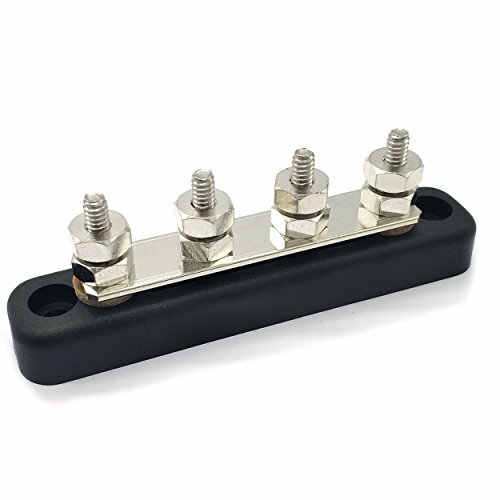 Equipped with 4 #10-24 studs for main wire connection. Maximum of 48 volts DC. 300 Volts AC. 100 Amps. 4 x #10-24 terminals. Tin Plated brass/ABS. Equipped with 4 #10-24 studs for main wire connection. Maximum of 48 volts DC. 300 Volts AC. 100 Amps. 4 x #10-24 terminals. Sold per each. this bus bar would require you to use a wire with a ring terminal on each end. Connect one end to the battery terminal and the other end to the bus bar. Then you connect the other wires to the bus bar. Maximum of 48 volts DC，300 Volts AC.